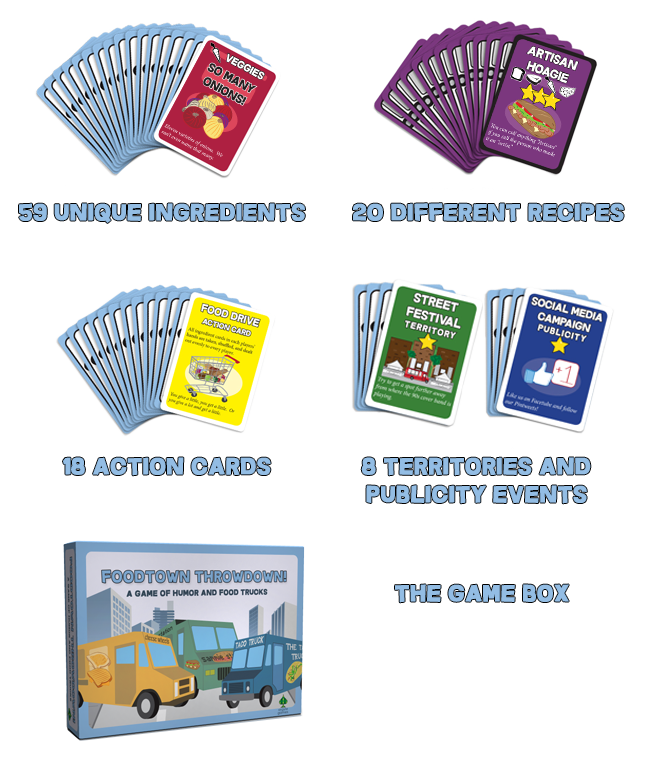 Foodtown Throwdown is a competitive card game for 2-4 players featuring 105 food-themed cards, tongue-in-cheek humor, and quick, easy to learn gameplay. Players compete to build the best food truck business in town by adding recipes to their menu with whatever crazy ingredients they can find. You will also need to establish your territory and publicize your truck while dealing with sabotage attempts from your competitors. Foodtown Throwdown is now available in the store! Download the Print-and-Play - note that the print and play cards have had much of the color removed and some pieces of art have been removed to make it more printer-friendly.